The Vacuum/Pressure Test Gauge is the best diagnostic tool for evaluating performance and isolating problems with-in any pumpout system. Using the test gauge a person can determine if there is an issue with the pump or with the plumbing. 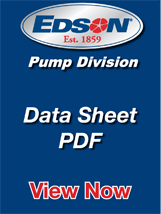 Edson describes its use and application in many of its installation and operation manuals. The gauge is provided threaded onto a 1.5” quick clamp plug coupled to a universal nozzle. The combination allows a person to connect the gauge and test any pipe, hose or fitting for pressure or vacuum with openings from 1.5” to 2”.